looked very Good!! Thank you for setting it up also. Ryan is a great guy and has got a great staff working for him. I stop by almost every morning on my way into the office to get an omelette. The lunch is awesome as well and the prices are really good. If you don't see something you like, chances are they'll make it for you. Wow! I recently used Ryan's cafe for a corporate catering event. The food arrived on time and was excellent, fresh and prepared perfectly. The detail was evident in the presentation of the food to anticipating utensils and condiments. When serving food to clients I usually do not hear compliments, but the group all had positive feedback on their meals. I have been ordering food for work events for several years and have never gotten this quality of food along with this high level of service at such a great value. I will definitely use Ryan's again and can't wait to see what the rest of the menu tastes like! . In this complex this is the best choice for a moderate-priced lunch counter. They always have a hot sandwich special, a wrap, and usually some other hot special. Don't be put off by a long line, they are lighting fast and get you through with amazing speed. I attended meetings in complex. Ryan's was selected to cater breakfast lunch and snacks. The food over the two days was excellent. I loved the variety which included options for those with food limitations. When I don't have time to pack a lunch - which is most of the time, I am riding the elevator down to get a quick lunch. They are super busy for a couple of reasons - they are the only place to get a decent lunch if you can't get out of the building and two, their food is actually good. And MOST of the time you get what you pay for. The breakfast there is delicious. When my stomach is growling before lunch I head down for a croissant, but I've also had their HUGE pancakes and hash browns. You get a lot for your money as far as breakfast goes. Maybe I am just cheap or maybe it's the fact that I don't have lunch brought in most of the week so spending $7+ a day is too much, but I am a fan of the grilled cheese sandwiches, wraps, and salad bar. The staff is really friendly and they are fast! All they need in there is a special for some Chinese food because they have American food, salads, and Mexican. Sometimes stir fry just sounds good! We have turned to Ryan several times for in-office catering. He is wonderful to work with, very flexible, and open to your suggestions on how to up-level your order. He will even talk you through your orde rto make sure you are providing the right amounts and mixes of food for your group. The prices are more than fair and the food is wonderful! I always have happy clients after a meeting where we have Ryan provide our catering. I wish every caterer I worked with was as pleasant as Ryan! Perfect place for daily lunch dining; particularly for those in the office park. Great variety and good value. Facilities are CLEAN and are kept that way. No grimey, dingy, dusty anything. A fine representation of what Normandale Office Park has to offer. Keep it up guys! Grabbing lunch just downstairs from the office is a huge bonus. It's quick even when there is a line during the lunch rush. The Food is good and Ryan offers "homemade" recipes from Grandma Swany, which are obviously better than any chain restaurant.I also use Ryan's for catering my office meetings - delivered fresh, hot and on time every time! The rewards program is awesome too, I earn gift cards to lots of different places. 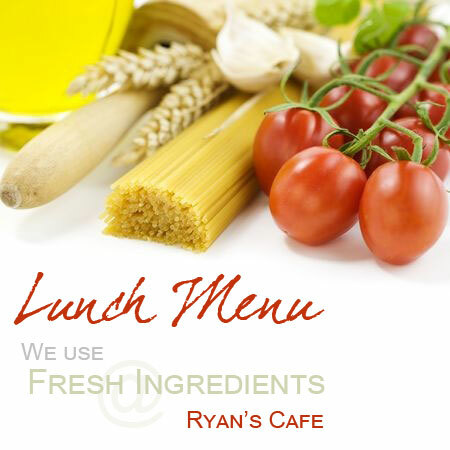 We appreciate your feedback at Ryan's Cafe, our mission is to keep improving our services to you. Please feel free CONTACT US and let us know what we can do to improve. Copyright by Ryan's Cafe. All Rights Reserved.